Ishara S. Kodikara | AFP | Getty Images Sri Lanka Prime Minister Ranil Wickremesinghe, center, speaks to supporters at the prime minister's official residence in Colombo on December 16, 2018, after he was reappointed as prime minister by Sri Lanka's president, the same man who fired him from the job nearly two months ago. December 17, 2018 (LBO) – Remember where we have been. In the moments after October 26th, and the days immediately following, Sri Lanka reached all time lowpoints in its constitutional democracy. Hunkered down in his official residence (Temple Trees), illegally deposed Prime Minister Ranil Wickremesinghe, his parliamentary group, and party supporters engaged in gallows humour in order to distract themselves from the stark reality that Temple Trees could possibly be stormed. An onslaught was speculated from security forces or angry mobs, unleashing on Temple Trees unprecedented levels of political violence. Those were dark times indeed. Now, fifty days later when the worst fears seem like a distant memory, it is easy to think of the episode as a nightmare and file it away into one’s subconscious. There is a temptation to forget and move on, without taking the time to recognise the sacrifices made, and strive to gain from the lessons learnt. Constitutional democracy has prevailed against all odds. The victory should be credited to brave political leaders, journalists, civil society, the public service, security forces and the judiciary. The individual who people often forget to give credit to is Ranil Wickremesinghe. The Prime Minister was defiant against the greatest attack on constitutional democracy that Sri Lanka has ever faced. He maintained dignity and poise under heavy personal criticism and under the serious threat of grave physical harm. During the crisis, Ranil Wickremesinghe conducted an impeccable political insurgency. Step by step he clawed back democracy though a brilliant legal and parliamentary strategy, combined with the inspiration and mobilisation of people who supported his noble cause. It is doubtful that any other political leader would have been successful. 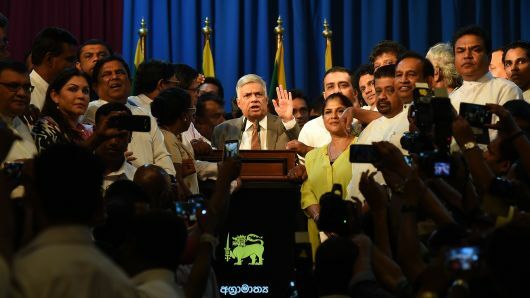 Sri Lanka’s constitutional crisis was easily Ranil Wickremesinghe’s finest hour in a 40 year political career that has seen him swear in as Prime Minister five times. Despite his leadership during the monumental political achievement of the restoration of constitutional democracy, few give him the credit he deserves. People are used to using Ranil Wickremesinghe as a punching bag. It’s easy as his skin is thick and he most likely won’t hit back. So now, with the country in pieces and the PM trying to put them back together, the punches are already being thrown against him. There are politically unrealistic demands that certain people be left out of the cabinet. There is mud being thrown about the failings of his formerly deposed government. The President is also vacillating irrationally making the task of governance even more complicated than it already is. His own party members are demanding certain positions, and his enemies are continuing their constant undermining of a man trying to get the country back on track. Ranil Wickremesinghe’s task is not an easy one. The country’s economy has been dealt a severe blow from the constitutional crisis, and it will take time to get things back on track. He will also have to lead provincial council elections, and a pivotal Presidential election in approximately one year’s time. Most importantly, he has to strengthen the elements of constitutional democracy that have shown catastrophic weakness in the depths of the crisis. Just like after the war, the nation needs to heal and come together. If we want democracy to be protected, it is in the interest of everyone to give the Prime Minster the space to operate and govern. Trying to tear him down before the country can be put back on the right track is counterproductive. Today marks a victory not for myself or for the UNP. It is a victory for Sri Lanka’s democratic institutions and the sovereignty of our citizens. I thank everyone who stood firm in defending the constitution and ensuring the triumph of democracy.